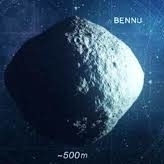 It is quite shameful what some folk will do to deceive, and describe as very good condition !!! No wonder there was just the one picture. Put in a complaint through eBay. The seller should be banned as violating trade description. Also ebay will refund you if the seller does not. This is what I bid on and won on eBay..
And this is what arrived today at my work..
On the plus side I also received today a nice Baader Eudiascopic 10mm and a pair of Opticron 8.5x50 Japan made binoculars (thanks FLO👍)..
Obviously a deceptive add, but were you able to check the optical quality and function before deciding to send it back ? 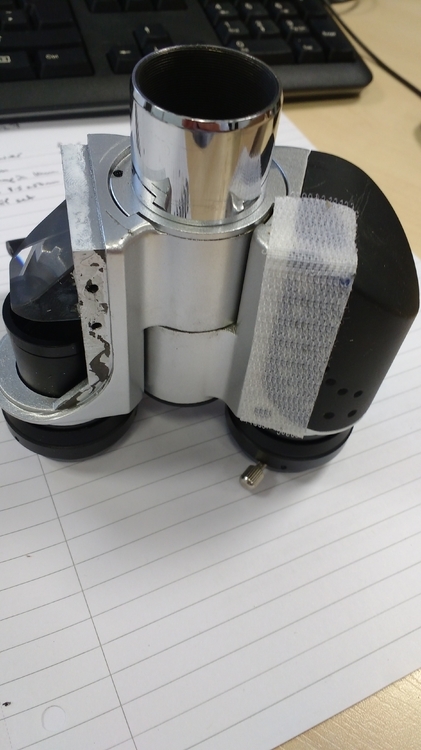 It looks like a glue failure which could be a production issue for others manufactured as well. Could you tell us what brand it was ? 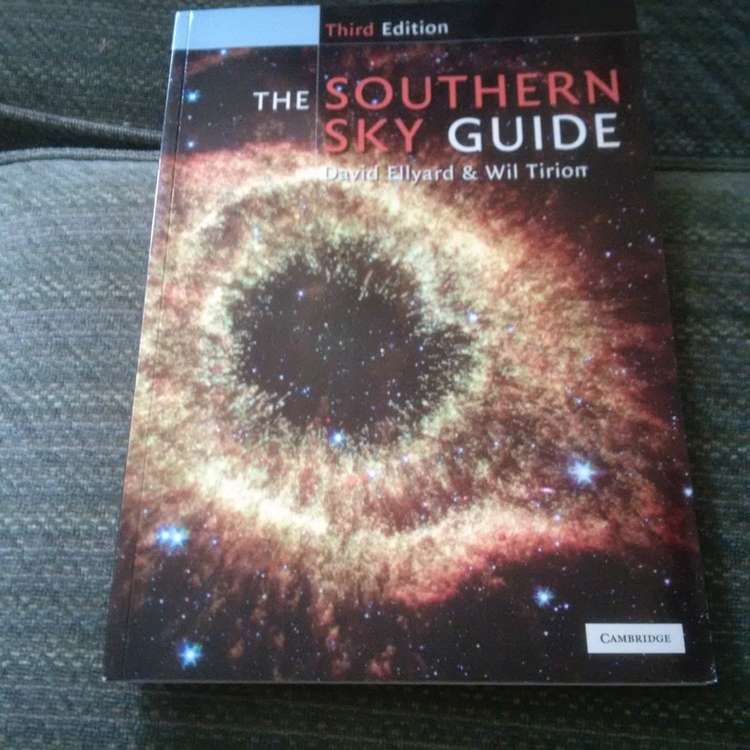 The Southern Sky Guide by David Ellyard & Wil Tirion. Only magazine thickness. Thick enough semi-gloss pages. Having read some of it, easy and informative to digest. Great help with orientation and placement. 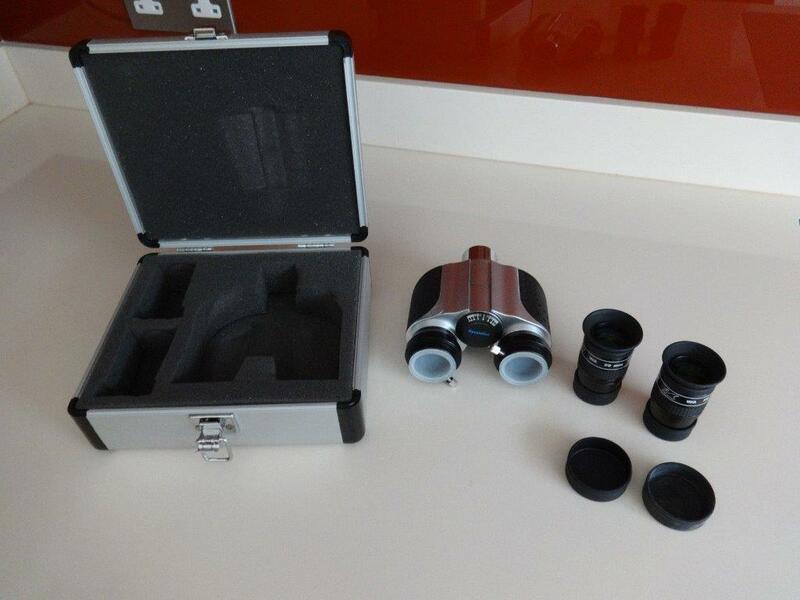 For binocular and small aperture magnitudes. Not sure how far south yet. 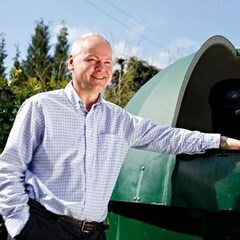 It was a Revelation unit with a pair of 20mm 66deg WO eyepieces. One of the prism covers was literally hanging off, the other was held on by very sticky tape, not shown in photos and clearly known about or even actually applied by the vendor..After that, the trust is gone so I don't care if they were usable or not, they weren't what I thought I was buying based on the description. I messaged the vendor and they quickly accepted my return request and I was sent a post paid return label by eBay to affix to the parcel. So I'm sure I will get my money back..eventually - PayPal have a habit of hanging on to refunded funds for far too long IMO! Glad you got sorted with the bino viewer. At face value they look to be in great condition, but you don't want bits of housing being held on with sticky tape. I'd love to see the image in the original advert. Dave, sorry to read this, but also glad I held back from bidding on this very item. The description and photos as you quite rightly say were not representing the items true condition, unfortunate and very typical of some vendors on the bay. Paypal will cough up within a reasonable time frame, just feels like forever when it’s your money. And that is very much the point, "the trust is gone"
I would have taken a punt based on the picture. 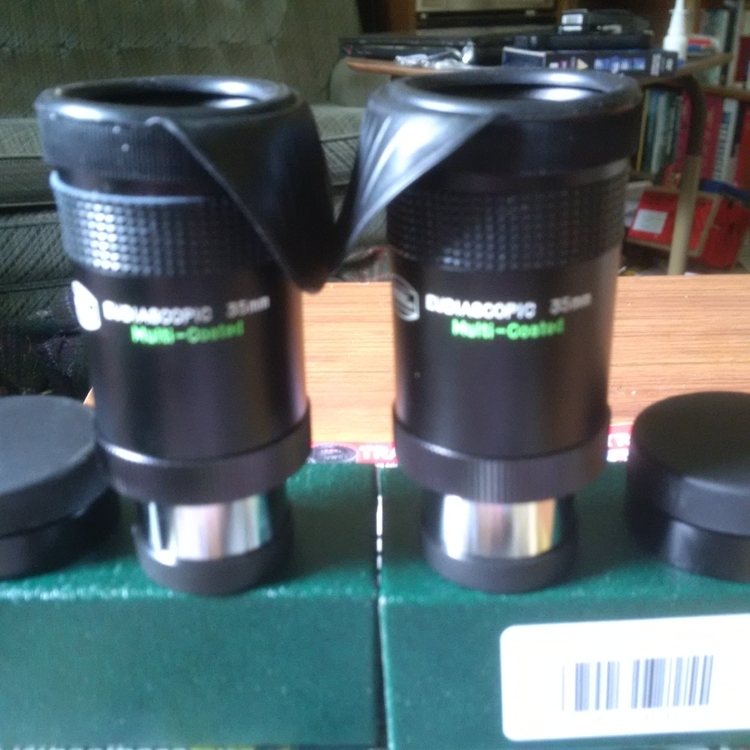 A few months ago I had to return a pair of Greenkat binoculars , which were very much not as described. It took approximately three weeks for the refund. Always beware of stock photos. Ask the vendor for WYSIWYG ones before bidding. That wasn't a stock picture. And "What I saw was most definitely what I got"!! The photos in listing were carefully presented and chosen, it was the sides not shown that Dave quite rightly has a issue with. 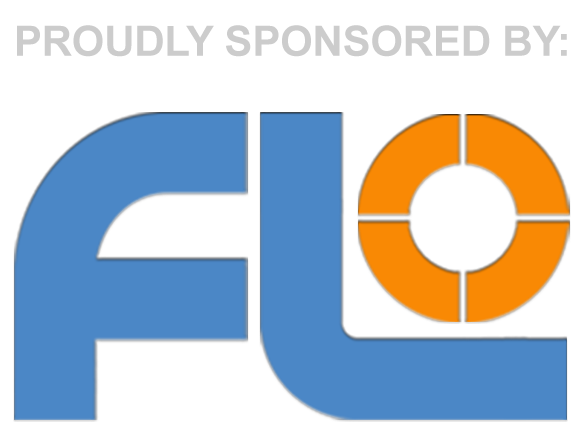 Over recent years it’s what you are not shown that should sound alarm bells with Fleabay listings. No returns is always questionable. I try to cover everything as honestly & as detailed as possible when I sell, so expect the same from vendors looking for my custom. No do, no buy! A3x15mm sheet of plexiglass - to be cut into two 8" shims to help fixing the mount to above post . Look forward to you posting and the pictures that follow. Pair of Baader Eudiascopic 35mm eps from FLO who are selling them again. Now I really need a better bino viewer! A pair of them, wow, nice one. Good eye relief. Best AFOV in 1.25 size. They have an eye distancer for people who don't wear glasses. Postie arrived and I am now a very happy camper. 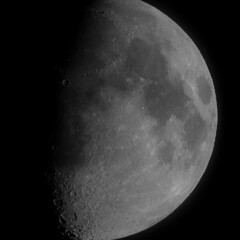 13mm LVW and its as described, thank you Tring Astronomy Centre. the clarity, comfort and build quality wins the day. Love my Vixens. NPL for me. One of these yrs ill upgrade and buy a low, medium and high mag. Hope your new Vixen performs as well as it should. If it is like the 22mm, which I am sure it is, then yes it will perform flawlessly to my eyes. but to me the clarity, comfort and build quality wins the day. Ebay has 3.5, 5 and 8mm somewhere. 17mm is harder to find. 30 is around, some 42 but usually in the US. Alan, you should buy the 8mm.It will be a nice high mag Ep to go with the 13and22. I'm not seeing any LVW on ebay.